Prime Minister Narendra Modi on Tuesday laid the foundation stones for two metro lines and affordable housing projects entailing an investment of over ₹33,000 crore in Mumbai megapolis. 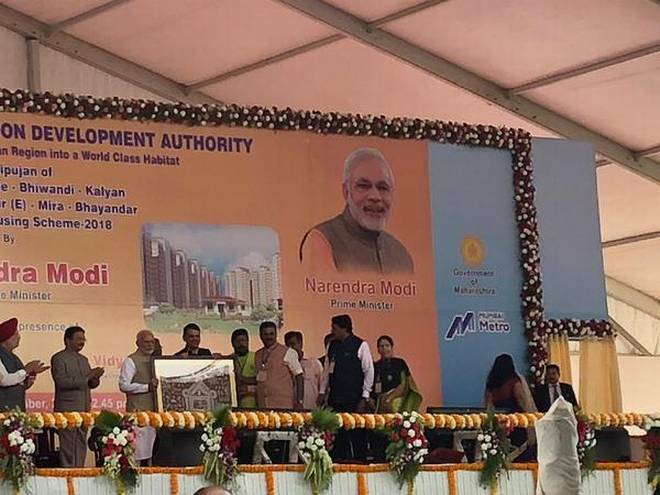 At an event held in Kalyan months, Mr. Modi kickstarted work on the ambitious Thane-Bhiwandi-Kalyan (Metro 5) and the Dahisar-Mira Bhayander (Metro 9) in this Mumbai suburb, which will see investments of over ₹15,000 crore. He also launched the Navi Mumbai town planning authority Cidco’s (City & Industrial Development Corporation) mass-housing scheme worth ₹18,000 crore, which offers around 89,771 affordable units under the Pradhan Mantri Awas Yojana. Accompanied by Chief Minister Devendra Fadnavis and Union Union Minister of State for Urban Development Hardeep Singh Puri, Mr. Modi laid the foundation stones for the these three projects. The ₹8,416-crore, 24.9-km-long Thane-Bhiwandi-Kalyan metro corridor (Metro-5) is expected to carry around 2.29 lakh commuters daily by 2021, with the entire system designed for six-coach trains. The corridor will have 17 stations. The 10.3-km elevated Dahisar-Mira Bhayander corridor (Metro-9) comprising eight stations, is expected to be completed by 2022, and the cost of the project is estimated at Rs 6,607 crore. Both the projects are being executed by the Mumbai Metropolitan Region Development Authority (MMRDA). As per the proposal, Metro-9 will be integrated with Metro-7 (Dahisar to Andheri) and Metro-2A (Dahisar -DN Road) along with the proposed Rs 3,600-crore Gaimukh-Shivaji Chowk (Mira Road or Metro-10). The tendering process to appoint general consultants and contractors for civil works for Metro 9 is in progress, and is expected to commence from next March. Currently, the northwestern suburbs of Mira-Bhayander are connected to Mumbai via the suburban line. At present, work on several metro corridors is underway across the megapolis, including the Dahisar-DN Nagar (Metro-2A), DN Nagar-Mankhurd (Metro-2B), Andheri (East)0- Dhisar (Metro-7), Colaba-Bandra-Seepz (Metro-3), the elevated Wadala-Kasarvadavali (Metro 4) and the Swami Samarthnagar- Jogeshwari-Vikhroli (Metro-6).